Infiniti was founded in 1989 as luxury division of Nissan, intended to rival premium carmakers primarily on US soil. It evolved into wide recognized marque from that side of Atlantic, but it struggles to gain a proper foothold on the old continent. Japanese are aware that as premium car maker they have to follow rules of the game, and that would include an offer of specially beefed up versions of otherwise regular models. Lexus has established its F lineup for many models, openly engaging M, AMG and RS rivals from German trio, while Infiniti is still searching for itself. We had IPL or Infiniti Performance Line, while you might forget about it till now, then imagination went wild with Q50 Eau Rouge concept, but we ended up finally with milder Q50 Red Sport 400. 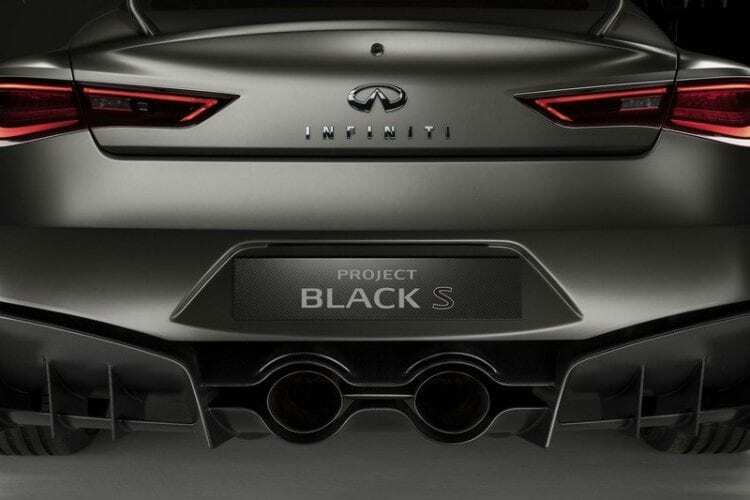 Now, again let your imagination go berserk, as we have 2017 Infiniti Q60 Project Black S in front of us. In this case, Infiniti gave special attention to the beautiful Q60 coupe. Maybe the most gorgeous car that was ever born from Nissan’s luxury division, with breathtaking beauty so passionate that it could easily be mistaken for Italian piece of art. And now, it’s turned brutal. Beauty turned to evil, menacing beast, with overly aggressive air intakes, carved hood, disproportionate diffuser threatening to hurt you, and huge rear wing. We bet that nobody could imagine that something so emotionally sculpted can be turned into something so deadly, visually of course. For interior sake, nothing is known about, but that is of least importance here. Maybe it is not deadly just visually? What if we say that it leans on the participation of Infiniti in F1 in this segment, more precisely through cooperation with Renault Sport team. 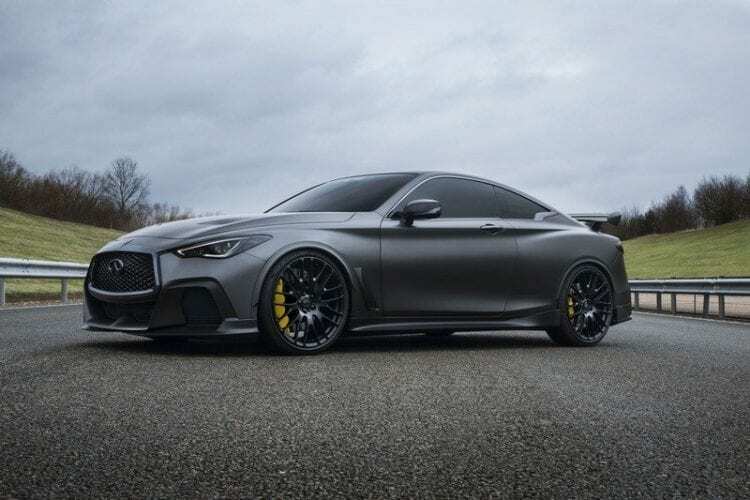 In this case, we have familiar twin-turbocharged 3.0-liter V6, the same one from Q60 Red Sport 400, but in this case from starting 400 hp expect a jump to as much as 500 horsepower in Black S. How? Well, in short- Renault Sport’s energy recovery system or ERS, currently used in F1. In long- mentioned system uses two things that are in same time motors and generators. In one case, one generator collects energy used from regenerative braking, other transforms hot turbocharger gasses into electricity, and they both store power in the lithium-ion battery. Then when you push your right pedal, generator becomes motor, one that directs collected power to the engine crankshaft, boosting power output, other spins the turbocharger also increasing output and more importantly diminishing turbo lag. Results are mentioned figures. What if Japanese decides to release 2017 Infiniti Q60 Project Black S on the street? Then it could properly rival with figures Mercedes C63 AMG coupe in its top S edition. That would also mean that Black S is by 100 hp more powerful that current Red Sport and way more powerful in figures than Beemer M4 and Caddy ATS V. And yes, it would be first car maker that actually use that type of F1 technology for its powertrain. Whether that is going to happen, we don’t know yet, though Infiniti has been bold with engineering lately, if you remember groundbreaking VC-T engine, so that could give us some hope. But surely, that level of visual aggression is hardly going to be offered on a production-ready vehicle, as that would be still after market tuning territory. Another option is for the company to deliver race-ready and track oriented car which surely would benefit with all that over the top aero bits and pieces.